It is starting to smell as if Bucs defensive coaches last year tried to shove round pegs into square holes. Bucs fans (rightfully) freaked out the past few years over Mike Smith, the shamed former defensive coordinator who ordered Bucs cornerbacks to give receivers more cushion than seen at a mattress factory. The results were predictable. And grotesque. When Smith was asked about this peculiar coverage, Smith waved off questions saying he allowed corners to defend receivers in a manner they were more comfortable with. 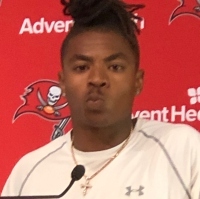 Just judging the body language of Bucs corner Vernon Hargreaves today, that was a line of fertilizer Smith was laying thick. Hargreaves literally could not suppress a smile when asked about new defensive coordinator Todd Bowles and what and how he is expected to play this year. When Hargreaves began to explain, he had an audible and very optical sigh of relief, sort of the way Joe has when he stares at his lifesize poster of Rachel Watson. Hargreaves went on to say his new responsibilities will be very similar to what he was used to when he starred at the University of Florida. Imagine that, asking a player to perform in a manner that brought him his greatest success. Just curious, what’s Rachel looking like these days as you peer through the curtains? If he could choose the way he covered then why didnt he press the WRs? If he could do that better. Hargreaves was below average at florida when he had to cover the future nfl wrs in the sec and it followed it with him to the nfl. If the Bucs get the old Gator version of VH3, think fans would be very happy. Think most of these corners will preform better not just due to the new scheme, but also the attitude and mindset it produces as well. the team is wasting time on this short, slow and stupid fragile fool…. vh3 bust is a complete waste of time for bucs and bucfans… do the right thing BA send his sorry arse back to clearwater… just another local failure the fans cant let go of. . Easier for me to believe that we had no coaching/development with these secondary guys than it is to believe that we simply drafted 6 complete busts that are not capable of improving year over year. Players cannot just play man coverage if DC has called a Zone defense play. A CB cannot just play press man when DC calls a Zone play. I see some here have decided to celebrate the April 1st holiday. If Bowles improves the pass rush as much as we hope the defensive secondary will also see an instant improvement. Hard for a DB to cover when there is no pressure against NFL quality QB’s. I know that coaching, or lack thereof, was a big issue with this team over the last few years (understatement of the century! ), however, I can’t help but be extremely cautious with any talk of a VHIII resurgence. Even “out of scheme” we should be able to tell what kind of player we have. He has not lived up to his 1st round status. In fact, the only thing he’s fairly decent at is doing the “ne-ne” after QBs overthrow his WR! Press coverage is great if you have big physical DBs or REALLY fast DBs. VHIII is neither. Wouldn’t be surprised in the least to see this dude ball out. No wonder BA saw potential all over the field. VHIII looked good before he went down too. PLUS, imagine how good Carlton and Whitehead might actually be when not playing for that TURD of a scheme. NOBODY on the D had confidence in the coaches, therefore no confidence in themselves. To hear this D is excited means they have something to prove. Either all the haters are trying reverse psychology or are too dumb to know the difference. Negative feedback DOESN”T work. Buy a dog for God’s sake. I’ll be rooting for VH3 and think he can be a good corner for us. But I also will not mind seeing the Bucs try and find his replacement. but you try to get yourself excited and pump up your team, when your coach basically throws you under the bus by saying they can do whatever they want. Sit him down and tell him his weaknesses and why you think he should play off coverage and the guy starts questioning himself. Wouldn’t surprise me in the least to see a completely different guy next year!! but you try to get yourself excited and pump up your team, when your coach basically throws you under the bus by saying they can do whatever they want or feel comfortable with. Imagine Carlton and Whitehead and how good they might actually be!!! This D has something to prove and sounds like they are ALL excited. Imagine if you will….a GM that drafts players for the schemes your coaches run. What a wild concept. No matter how you slice it…..either the GM drafted the wrong players for the scheme that existed…OR….extended the wrong coach for the type of scheme he wished to run. Eh. Hargreaves is a bust and don’t think scheme will make a difference for him. Its just funny most people thought this about him except for gator fans and Licht. I never understood when people said that they were professionals and play any scheme. Sure, some players can adjust, but why force your whole team to do a scheme, that they never played in. It just always seemed stupid to me. Anthem yes. He and Spence. Six years of worthlessness between the duo. There is a common denominator there New Jack City. @St. Pete- You stated something so enlightening on the other thread. Your research showed you Jameis was better under pressure than he was when given time to throw last season. I wondered to myself why and how could that be. Carson Palmer provided insight while on NFL network weeks ago. He stated “Jameis is going to be successful because BA is about to teach him exactly where to go with the football”. Where as I’m assuming klueless called plays and left it solely up to Jameis to find an open receiver. Huge difference. Jameis is now about to excel because he will now be an extension of BA’s mind on the football and not just QBing trying to figure it out in the field of play. been saying for 2years, the problem has been lack of coaching not talented players…..
in a man press type of scheme VHG, ryan smith, carlton davis will all succeed…. We’ve all heard this same song and dance from players that have repeatedly under performed their expectations. Years ago it was Da’Quon Bowers complaining that he wasn’t used correctly under Schiano. When the new coaching staff arrived it turned out he still wasn’t very good. I expect somewhere between now and training camp we’ll hear Noah Spence say something similar. Sounds good to me. And if anybody would know it’s Carson Palmer. I’m a gator fan and Never wanted VHIII. Nice kid. Has skills. Just too small and too slow. It was obvious when they drafted him and it’s obvious now. He can be productive and may pick off a few as well, but at the end of the day he will give up yardage to taller faster receivers. I’ll never forget the interview with the secondary coach…or DB’s coach. The guy flat out said almost word for word ( can’t remember exactly ) that press coverage was almost the equivalent to playing flag football and that it takes more skill to play off coverage and press coverage was too predictable and easy to beat. Basically made it clear that he was totally against it. Stupid. It’s not about having more skill than the other guy. Two players can have totally different skill sets and be equally talented. Agree again Anonymous. Tighter coverage will give our pass rushers better opportunity. I like the fact that BA and Bowles promise an aggressive approach unlike Smitty’s namby pamby D.
I spend so much less time in here because of the trolls. Joe’s please… It’s JoeBUCSfan, but we continually have to read what tmaxipad and all his anti-Buccaneers comments on a daily in here. It’s a kill joy to say the least. Kick the Bucs hater to the curb already and emulate the name this site is actually titled after… This isn’t about denying people a voice or allowing Bucs fans to show their displeasure. It’s about getting a non Buccaneers fan and an obvious troll out of real fans having debate and discussion about their team. Buc4eva…you have to be able to play a coverage other than press. Thinking you can only run press is dumb. I continually have to skip over certain people’s comments. Day after day. They never have anything insightful, constructive or novel to add to a discussion. They continually dredge up the same old low-level sh*t and and childish remarks. True fans discuss pros and cons but actually root for a team that they love and support in the end. Real fans always support their team as much when they lose as when the win. Yes, would be fans have had to endure 11+ years of losing seasons since our only Super Bowl win. Think about all of those Chicago Cub fans who attended games or listened on the radio or watched them on TV during their hundred year drought. Free wheeling debate is fun! Wallowing in negativity gets old! P.S. C’mon Joe(s). This is your blog. You have some discretion and leeway after all. Joe doesn’t believe in censorship of comments unless they get out of hand or slander people. Accusing Bucs players of felonies is a very good way to get run. Lying about Joe or misrepresenting him is another way of seeing comments edited. It’s not about censorship Joe, it’s about membership. 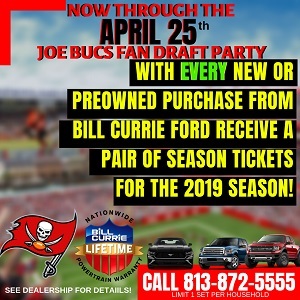 He’s not a member of Bucs fans… Again, why title the site Joe Bucsfan if non Bucs fans are allowed to infiltrate and ruin it for the actual fans of the team? ^ It would be about censorship, Chris. He has been a Bucs fan for 40 years. You may not agree with his sentiments that are spoken with much venom. I disagree with a lot of it too. But yes, he IS a Bucs fan. He’s not a Bucs, Demon. I’ve read enough to know. He’s called the Bucs a garbage franchise and will never be winners multiple times. Tell me how that makes him a fan of the team? He’s a troll, plain and simple. Even the toughest of fans would say I’m tired of losing and say stuff like this needs to change, etc etc etc… But to call “Your” team garbage and everything about it trash isn’t someone who’s rooting for a turnaround.. It’s someone who loves to troll the fan base and nothing else. bruce will have fun…. oh he will have fun right up until week 4 and the nut-punch comes and by week 9 he will be looking for excuses health or otherwise to escape the black hole that is Tampa bay buccaneer football. There is more hope for an original Beatles reunion with Michael perv Jackson and Whitney Houston opening up than bucs competing at a nfl level. Tell me how he’s a Bucs fan again? I don’t mean to speak for him. It seems that for him…….. he is a long time Bucs fan, AND he considers them a “garbage franchise”, based largely on ownership. I definitely understand everything that you are saying. He and I have had a few battles. But I do believe that all fans react to years & years of frustration differently. For some, it results in venomous anger in rants that I sometimes doubt he even truly believes or feels. Anyway, interesting thoughts & debate. I share your love for this team and always will. GoBUCS. Exactly what I am talking about. All fans respond to years of “nut punches” differently. All fans handle it differently. Anyway again,,, good convo and I like your posts.